The Cathedral of Orvieto is primarily known for one of two things: as the site where the Pope instituted the Feast of Corpus Christi or for the dramatic apocalyptic narrative frescoes by Luca Signorelli. Interest in these aspects of the cathedral and its history has tended, however, to eclipse other components of the cathedral and its decoration. 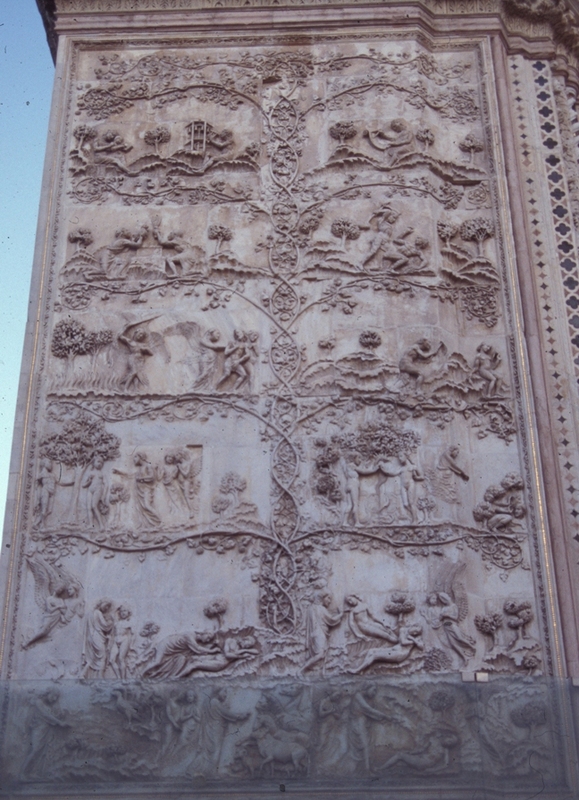 For example, the vine scrolls framework of the reliefs on the four pillars of the façade chronicles the outworking of God’s relationship with mankind from Creation to Last Judgment. These façade reliefs, created by Sienese sculptor Lorenzo Maitani (c. 1275–1330) in the early fourteenth century, employ generative foliate imagery in the prominent use of an espalier motif of a trailing plant trained to grow close to a wall. Each of the four pillars of the façade at Orvieto bears a vine, carefully cultivated, that upholds the sacred histories presented there. From left to right the pillars represent Genesis with a tree of the Creation and Fall, the Old Testament with a tree of the law, the New Testament with a tree of the gospel, and Revelation with a tree of judgment. Together they present the viewer with the unity of the doctrines of the creation, fall, redemption, and judgment that reveals the hand of God at work in history to bring about the restoration of mankind—and all creation—to himself. The first pillar, on the far left of the façade, employs a vine of ivy. It presents the story of the goodness of the creation until the first murder—of Abel by his brother Cain—ending with the toil that is the lot of fallen humanity at the top. Ivy is closely associated with death and the immortality of the soul. Because it is evergreen, it is a symbol of faithfulness and eternal life. The ivy, which clings to its support, is also a symbol of attachment and undying love. Because of its tenacity it becomes associated with Christ. The ivy vine twines in and out of these events, creating an infrastructure that literally bears the weight of the story of the fall of man. It is a sign of God’s faithfulness, undying love and promise of help in spite of mankind’s rejection. The fourth pillar, like the first, bears a vine of ivy to link the Fall of the original creation with its redemption. The ivy is visibly different from the first in a number of ways. It is lush; burgeoning with life and full with leaves. The narrative scenes begin at the bottom with the Resurrection of the dead, the Last Judgment, and the descent of the damned into hell. These are followed in ascending order by the angels leading the blessed to heaven, the saints and Christ the Judge seated at the top. Notably, Christ is presented enthroned in a mandorla, a sign of the divine revealed to mankind. This panel is not only a celebration of man’s redemption but of God’s sovereignty that is both merciful and just. It is significant that each of these panels read from the bottom up reflecting the unfolding of divine providence that is the ultimate anagogicus mos, the upward leading way of God’s plan of redemption. The ivy espalier of the first and last pillars serve as a visible testament to God’s sovereignty, linking mankind’s fallen state, presented at the top of the one, with the depiction of his unwavering rule on the other. Instead of abandoning his rebellious creatures he persisted in bringing about their restoration. The ivy vines should be understood not just as a promise of redemption but also as an eschatological reality of the destiny of the soul and humankind, for from a divine perspective, where all of history is known to God, it is already fulfilled, complete in God’s time. The espalier form of the ivy and acanthus on these pillars makes manifest the underlying order of God’s providence, bearing witness to his faithfulness, resilience and undying love. And the ebullient ivy of the culminating scene of the ruling Christ reflects the release from the constraints of sin and death and celebrates the abundant life that is come. 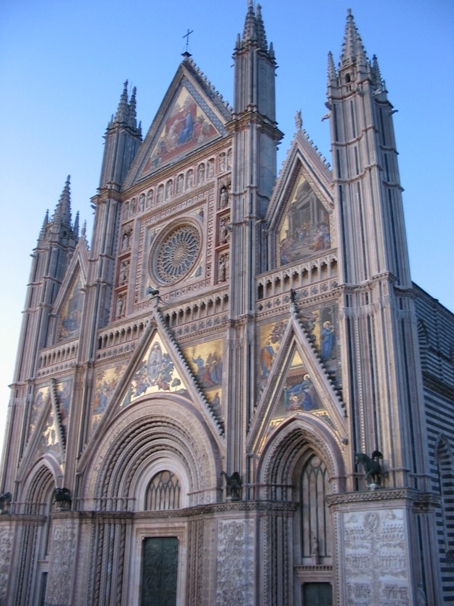 Orvieto Cathedral, 13th–14thc., Orvieto, Italy. Photo permission of Rachel Hostetter Smith. Lorenzo Maitani, Genesis Relief, early 14th century, Orvieto Cathedral, Orvieto, Italy. Photo permission of Rachel Hostetter Smith. Rachel Hostetter Smith is Gilkison Professor of Art History at Taylor University in Upland, IN, USA. Dr. Smith is on the board of the Association of Scholars of Christianity and the History of Art (ASCHA). See: http://christianityhistoryart.org. Along with scholars James Romaine and Linda Stratford she has pioneered the development of ASCHA which was founded in 2010. ASCHA continues to gain significant recognition as an important scholarly forum for the study of the relationship between Christianity and the History of Art. She was curator of ‘Charis: Boundary Crossings’, a traveling exhibition of Asian and North-American artists and is currently directing a similar project originating in South Africa entitled ‘Between the Shadow and the Light’. For information contact her at rcsmith@taylor.edu. She writes on a wide range of topics related to Christianity and the Arts.